For updates and live coverage on the latest protests and violence in Egypt follow me on Twitter @EmkayXx or like Egyptian Streets on Facebook. A full analysis will be posted here in the coming days. 1. The new, Islamist-drafted, constitution does not allow for the President to be held accountable for the killing or torture of protesters. This means that Morsi will not be held accountable for any of the recent (and upcoming) unrest. Yet, it is Morsi and his Islamist buddies that time and time again accuse Former President Hosni Mubarak of killing protesters – irony. 2. 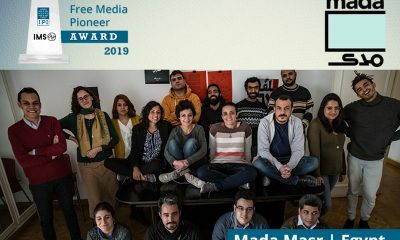 In a surprising turn of events, the Prosecution has stated that activist Mohammed El-Gindy was not killed following police brutality or amid violent clashes – he was killed in a car accident. Following reports of his death due to police brutality, thousands attended his funeral, which then turned into an attack on police stations in Tanta (his hometown). Correction: The Prosecution has indeed stated this, however security sources now confirm that the Prosecution is trying to cover it up, and that El-Gindy DID indeed die from torture. 3. 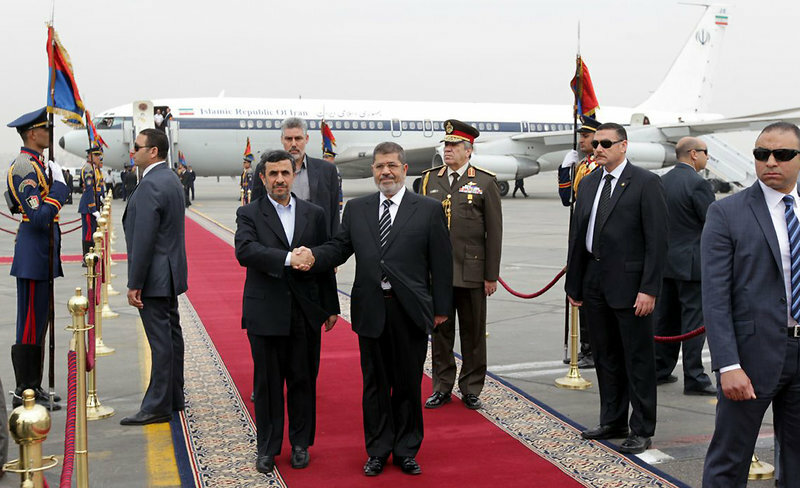 Iranian President Ahmadinejad has arrived in Cairo – becoming the first Iranian leader since 1979 to visit Egypt. “President” Morsi met Ahmadinejad at the airport (an unusual change in protocol – Mubarak didn’t even wait for Obama at the airport). Al-Azhar’s Grand Sheikh has said Iran should respect the sovereignty of neighbouring countries and not seek to spread Shia Islam. A Syrian man is also reported to have attempted to attack the Iranian leader while he was exiting a mosque. 4. Egypt’s foreign currency reserves fell by 10% in January amid continued unrest, falling by $1.4bn during the month from $15bn to $13.6bn. This is a major setback and will make the Egyptian government more desperate for the $4.8bn IMF loan. For comparison, in 2011 (before the revolution), Egypt’s foreign currency reserves were at $36bn. 5. Hisham Qandil, Egypt’s PM, has stated that “everyone is new in this democracy thing,” perfectly summarizing the government’s ineptness. One again, Qandil blamed the previous Mubarak regime for the “obstacles” that Morsi has been facing. In another gaffe, the PhD-holding Prime Minister stated “There are villages in Egypt where infants get diarrhoea because their mothers are too ignorant to clean their breasts before feeding them.” We all thought the idea of “wearing cotton in summer” and “turning off your television and going to sleep early” were bad, but this statement takes it to a whole new level of hilarity and mockery. Top Story: According to Al-Arabiya, Qatar has provided 250 million dollars to Hamas in order to ensure the protection of “President” Morsi’s regime and to maintain his rule for as long as possible. 1. This coming Friday has been declared as the Friday of Departure – with protesters giving Morsi and his government the ‘final warning’. The National Salvation Front has announced that it will be taking part in the protests in calling for a united, salvation government. Meanwhile, the Freedom and Justice Party has claimed the NSF has a foreign agenda to destroy Egypt. 2. A 28-year old activist died today after suffering serious wounds. The activist, Mohammed el-Gindy had gone missing since January 27 at Tahrir Square. According to the Egyptian Popular Current Party – led by Hamdeen Sabbahi – the man died after being “tortured to death” by security forces. The opposition party claims he was electrocuted, had broken ribs, and signs showed that a cord had been wrapped around his neck. So far, the Interior Ministry has refused to comment. 3. Although Egypt’s stock market has lately been closing on positive signs, Egypt’s tourism sector has been ravaged by recent unrest. According to sources, average hotel occupancy across Egypt’s popular tourist destinations is at a mere 25-30%. This may have been one of the causes for Oberoi Group to withdraw from managing the historic Mena House Hotel (which it had been managing for 40~ years) in January. 4. Egypt’s Health Ministry has re-issued a state of alert in regards to Polio after it was found in more sewage water across Cairo. Polio – which had been eradicated in Egypt since 2004 – causes paralysis and generally targets children. 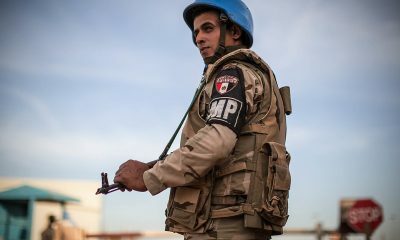 With low vaccination supplies, the WHO and other NGOs have been assisting Egypt in containing the outbreak. 5. Hamada Saber, the man who was seen on live television being beaten, stripped, and dragged by police officers, has finally admitted that he was being forced to lie by police officers who were ‘torturing’ him in hospital. The Prosecutor-General has moved the man from the police hospital to another one while an investigation is undergoing. 6. A second protester has died after sustaining serious injuries on the Friday of Deliverance outside the Presidential Palace. The man – a 20-year old – died from gun shot wounds. Meanwhile, a man has been killed in clashes near the U.S. Embassy in Cairo. The clashes – which are mainly based at Qasr Al-Nil – have been ongoing for several hours with reports of several injuries. 7. Iranian President Ahmadinejad is to make the first visit to Egypt by an Iranian leader since the 1970s. Ahmadinejad is to attend the summit of the Organisation of Islamic Cooperation in Cairo. Ahmadinejad has submitted a request to visit Tahrir Square during his stay in Egypt. 8. Seven were killed and more than 35 were injured after a Tour bus rolled several times and crashed in the Sinai. 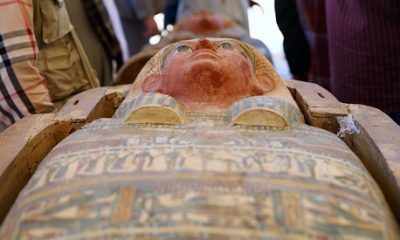 The passengers were all Egyptians and the tour bus was operated by Egypt’s Metro Authority. 9. Egyptian newspaper Al-Shorouq has released this great comic today showing an Egyptian citizen stripped of clothing and dragged by a regime that is stripped of legitimacy. A regime stripped of legitimacy. 1. Despite complete outrage at the beating and stripping of a protester outside the Presidential Palace, he has adamantly claimed that the police were in fact ‘helping him’ (by kicking him, punching him, dragging him, and ripping off his clothes apparently). His daughter has spoken out, claiming that her father was beaten in hospital and threatened by the Interior Ministry if he accused police officers of beating him (video below – in Arabic). Nevertheless, human rights groups and political parties have called for an immediate investigation into the incident. The NSF has also called for the dismissal of the Interior Minister. However, the man’s beating was not the only incident of police brutality. Al-Hayat television has shown footage of a female protester being pulled from the hair and dragged by security forces outside the Presidential Palace. 2. 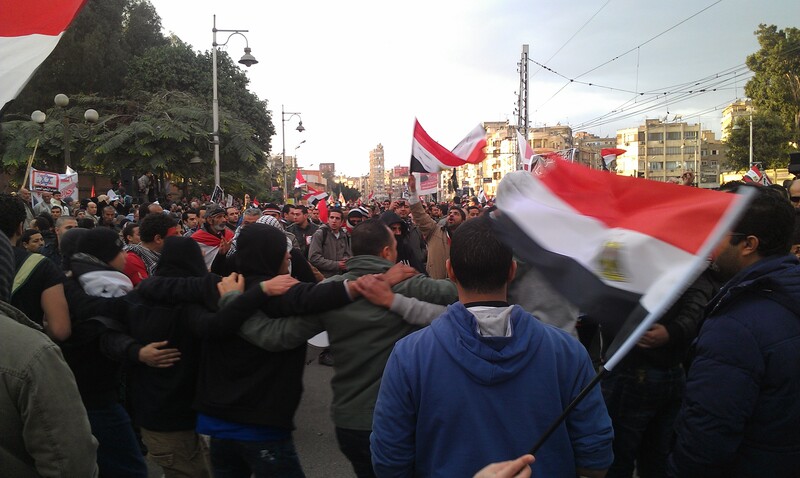 Clashes have reignited between protesters and security forces outside the Presidential Palace in Heliopolis. Protesters have thrown several Molotov cocktails at the palace while police has responded with heavy clouds of tear gas, water cannons, and live ammunition. In Alexandria, protesters and security forces clashed for several hours forcing the withdrawal of police officers for a few of these hours. 3. Hamdeen Sabbahi – opposition leader and member of the National Salvation Front – has declared that the NSF has sided with the people in calling for the fall of the regime. He added that the NSF will not engage in any further dialogue with the President due to the continued violence against protesters and the refusal of the President to hear the demands of the people. Meanwhile, Amr Moussa warned that Egypt’s economy is on the brink of collapse. On the other hand, the Muslim Brotherhood has blamed the violence on the National Salvation Front’s support of a continuation of protests. A Muslim Brotherhood member also added that those outside the Presidential Palace and at Tahrir are not “revolutionaries” but are “thugs” and “rioters.” The Muslim Brotherhood has spread the video below – showing protesters throwing a barrage of Molotov cocktails over the Palace’s walls – as evidence of this. 1. In what started off as peaceful protests outside the Presidential Palace with thousands in attendance quickly fell into chaos as groups of youth threw Molotov Cocktails at the Palace – causing a small fire – with security forces responding with tear gas, water cannons, rubber bullets, and live ammunition. The clashes resulted in the dispersion of the majority of protesters, the burning of tents (of protesters), and the death of one protester who was shot in the neck by police officers. 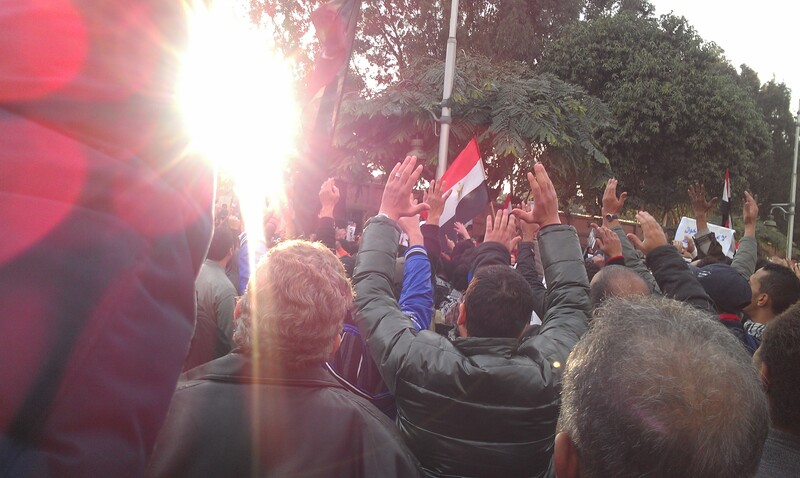 Before the clashes: many gathered outside the Presidential Palace calling for the ouster of Morsi. Egyptians sang and chanted against Morsi and the Muslim Brotherhood. 2. The video of a protester being dragged, beaten, and stripped naked by police officers has caused outrage in Egypt and the international community. “President” Morsi has responded, stating that the video deeply “hurt him” – although Morsi probably means it “deeply” hurt him emotionally, it also deeply hurt his image among Egyptians. The video is bound to raise questions about the integrity of the Interior Ministry and whether or not it has truly been ‘revamped’ under Morsi. 3. In Port Said, Egyptians called for the trial of Morsi and declared Port Said ‘independent’ (although this obviously has not come to effect). 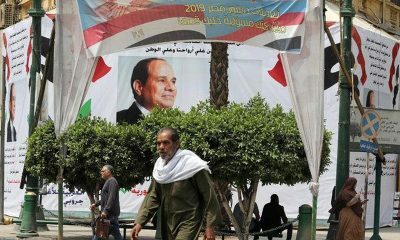 Reports of minor clashes in Port Said, Suez, Alexandria, and other cities – yet not compared to those outside the Presidential Palace in Cairo. Protests were largely peaceful but scattered incidents of sexual harassment occurred. A group called “Op Anti-Sexual Harassment” has been attempting to secure female protesters against sexual assault. This dummy of Morsi was seen floating around Tahrir Square. 4. Prime Minister Hisham “Cottonil” Qandil adamantly declared that “No government is capable of ruling Egypt” during this turbulent period. Instead of admitting that he and his government are incompetent, he has pretty much said that Egypt is a total clusterf***. 1. The total death toll in Cairo from the past few days has increased after at least five were killed yesterday. The latest deaths came after two who had been shot by security forces at Simon Bolivar died in hospital last night. A third was shot and killed on scene yesterday. No major protests or clashes today (yet) – cold weather and rain have led to an uneasy calm in Cairo’s Qasr Al-Nil and Simon Bolivar (or Simon “Bolibar” as Morsi likes to state). In other cities, protests are expected to start later tonight and merge with nation-wide protests that are planned on Friday the 1st of February. 2. Reports indicate that thousands of police officers are starting to strike and mutiny – refusing to continue ‘serving Egypt’ amid continued violence and unrest. The police officers have cited a lack of resources, long working hours, and continued attacks on their personnel by ‘protesters’. 3. Egypt’s Al-Azhar Sheikh (top Islamic figure) is meeting with the leaders of various political parties – including El-Baradei – in order to attempt to stop the violence and bloodshed in Egypt. Al-Azhar is often seen as ‘moderate,’ and has regularly gone head-to-head with the Muslim Brotherhood and other extremists. 4. 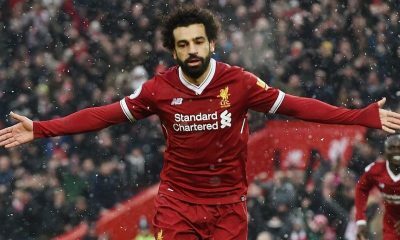 In a meeting with the Egyptian community in Germany, “President” Morsi claimed that “thugs” tried to ‘destroy’ a military plane that was hovering above a prison in Port Said. Not sure how these “thugs” would have achieved that without some kind of RPG, but let’s just imagine a world where a rock or a pistol can destroy a military aircraft. 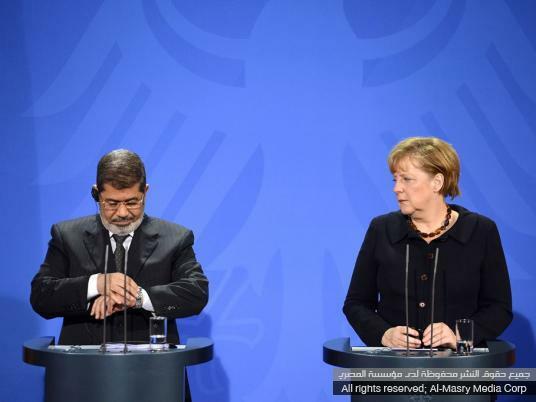 In other news, the mocking of Morsi has reached new levels in Egyptian media, following a series of photographs from his trip to Germany. 1. 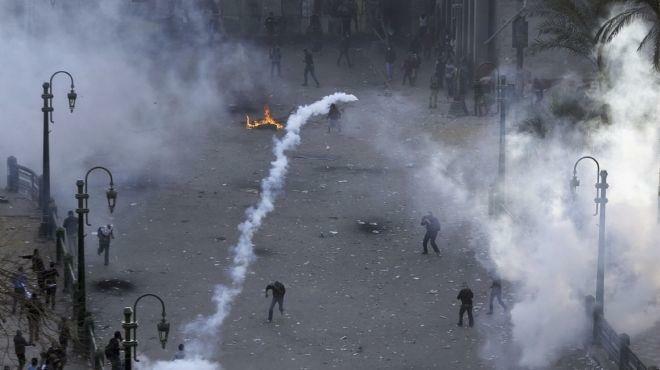 Four protesters – including a 16-year old – have been shot dead near Tahrir Square today. One was killed by unknown assailants firing birdshot at protesters on Qasr Al-Nil Bridge, while the others were killed in an attack on protesters by a group of armed men a who arrived in a ‘tour bus’ at Abdel Moneim Riyad (near Tahrir). Tens were injured. 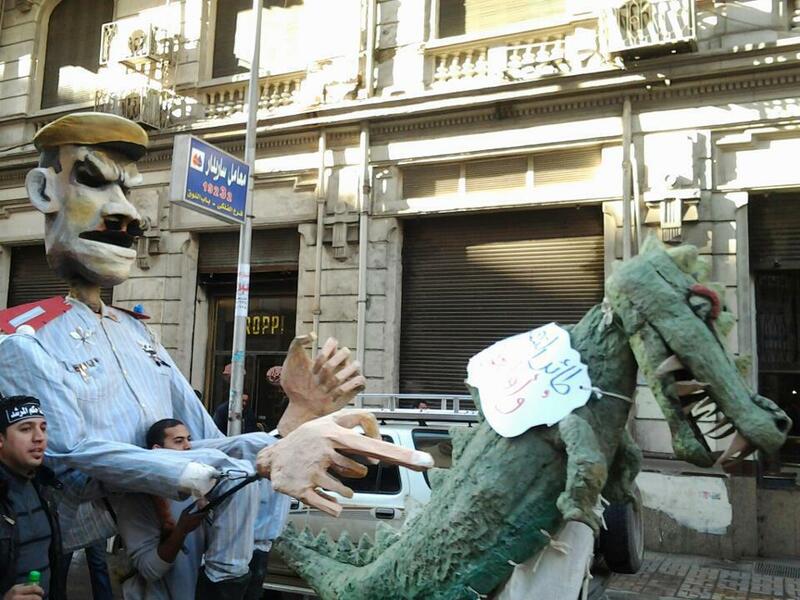 Protesters have blamed Muslim Brotherhood ‘thugs’ for the attacks. Could this be the first sign of attacks from the Islamist ‘White Bloc’? 2. The National Salvation Front has called for urgent dialogue with the Presidency, the Muslim Brotherhood, and the Salafists – just two days after the NSF rejected such national dialogue. The NSF has also renewed its calls for a salvation government, stressing that a government that represents all of Egyptian society is necessary to stop the bloodshed. 3. Egyptians and non-Egyptians in Germany have mobilized against Morsi, holding signs and chanting for his departure. Amnesty International has also taken part, calling for an end of police brutality and violence against protesters. Morsi’s visit to Germany during the unrest has caused controversy among Egyptians who believe he should be attempting to restore calm before travelling abroad. 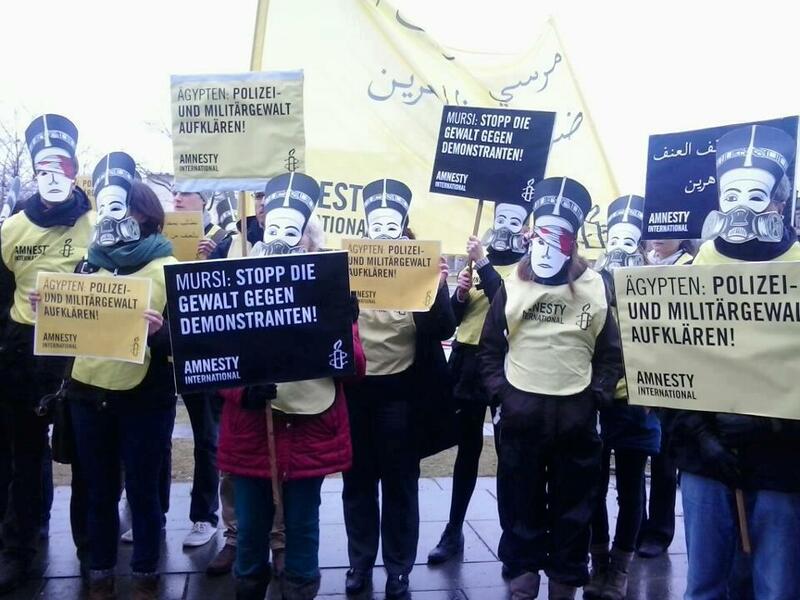 Protesters in Germany holding anti-Morsi signs today. 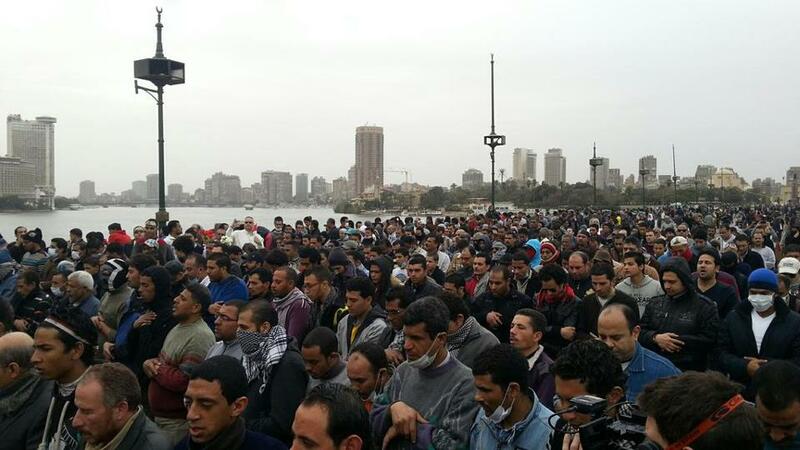 1.Thousands took to the streets to protest the curfew in Suez, Port Said, and Ismailia. Reports (spread by Ikhwanweb and other MB officials) indicate that Morsi is planning on cancelling the curfew. In just two days, it appears Morsi has given up/taken back his decision – as he normally does. Confirming the reports, the Mayor of Ismailia has announced that the curfew will be cancelled in the coming hours in Ismailia. 2. Thousands took part in Protests across Alexandria. Protesters blocked the Corniche and many other main roads and tram lines. Moreover, the Sidi Gaber railway station was occupied by protesters who cut off the operation of trains. 3. Over night, clashes intensified at Qasr Al-Nil outside the Intercontinental Semiramis Hotel. The hotel’s lobby was trashed by unknown assailants many who were later detained after protesters and the police (for once) worked together to stop the attack. 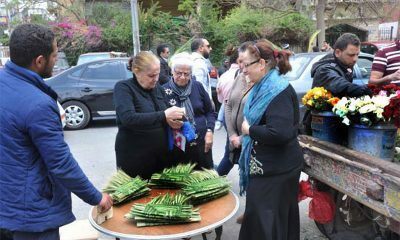 However, this morning, dozens of guests have left the Semiramis hotel as well as neighboring hotels. The Intercontinental hotel has demanded that the Ministry of Tourism compensate the hotel for the losses sustained by the hotels, which have been calculated to be at nearly 7 million Egyptian Pounds. Management claims that despite repeated calls to the police and the military, no one came to their help; it was the protesters that helped stop the looting. 4. Clashes are on-going at Qasr Al-Nil, outside the Intercontinental Semiramis. The streets outside are filled with rubble and burned-out tires – resembling a ‘conflict-zone’. Reports of birdshot being fired at protesters and security forces. The embassies of the US, the UK, Canada, and others have remained closed. 5. Egypt’s Defense Minister has warned that the country is on the brink of collapse if the unrest continues. 6. The Prosecutor-General has ordered the arrest of the ‘Black Bloc’ members, after deeming the group a “terrorist” organization. In response, the Black Bloc has shut down its Facebook page and urged people to ‘ditch black balaclavas and masks’ in order to avoid arrest. The Black Bloc are a group of masked young men who have described themselves as the “defenders” of the protesters, and have declared their anti-Morsi stance. Humorously, the Hazemoun (followers of Hazem Abou Ismail – a salafist who attempted to run for Presidency) have formed the ‘White Bloc’ to ‘take action’ against the Black Bloc. Egypt has become a chessboard! “Black Bloc” members protesting on the front lines on January 25th. Overall: In my opinion, the ‘Black Bloc’ is not actually an organized group of people – instead, the idea of a “masked group of people” spread quickly on social media and inspired people to “dress in black” and protest. 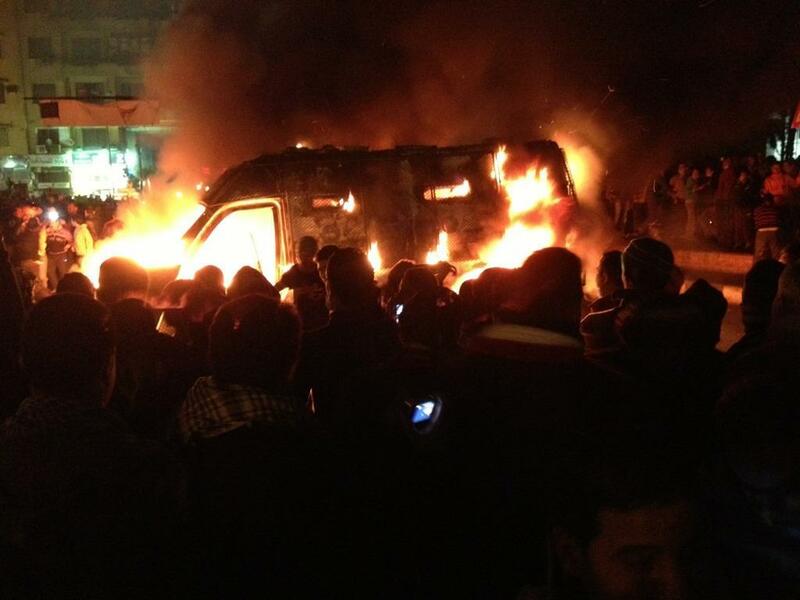 Apart from that, no major clashes or protests have broken out in Egypt today. 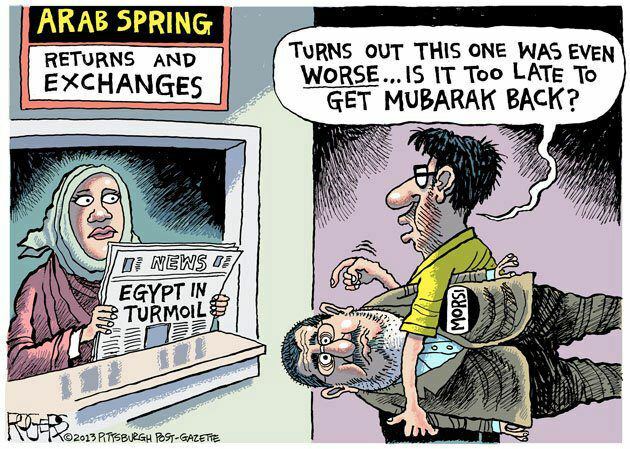 Perhaps Egypt is witnessing calm before the storm? Major protests are planned for Friday, the 1st of February. 1. Protesters at Tahrir Square have seized control of a Central Security Force APC after it ran over two protesters. The APC has now been torched and protesters are jubilant. The police officer accused of running over the protesters and shooting one in the head has been ‘detained/captured’ by protesters. There are also reports that the Semiramis hotel on the Nile has been over-run by protesters seeking cover – indications of minor scuffles and looting occurring within the hotel. 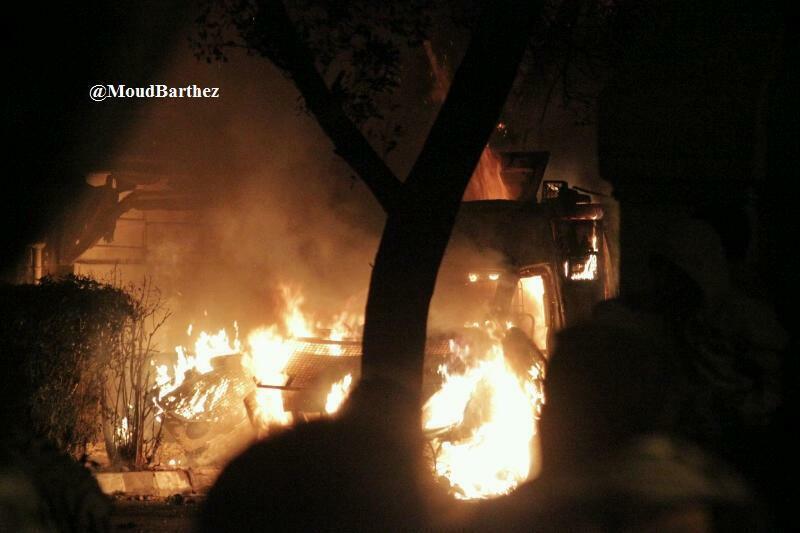 Another CSF APC vehicle on fire after being hijacked. 2. Marches on Sayeda Zeinab street heading towards the Shura Council were unexpectedly attacked by security forces using rubber bullets (for the first time since the violence started) and tear gas. Clashes have greatly intensified, and many are injured. 3. The National Salvation Front has rejected calls for national dialogue by Morsi. 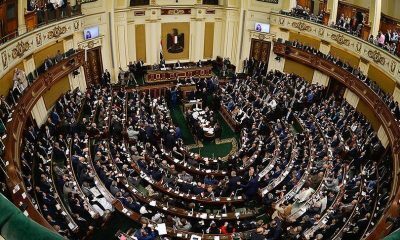 Among their demands are: the dismissal of the Interior Minister, the dismissal of the Prosecutor General, and the creation of a transitional ‘salvation’ government that represents “All Egyptians”. The NSF has stated its support for the cities of the Suez Canal, stating that they will not allow their citizens to be ‘isolated’. 4. 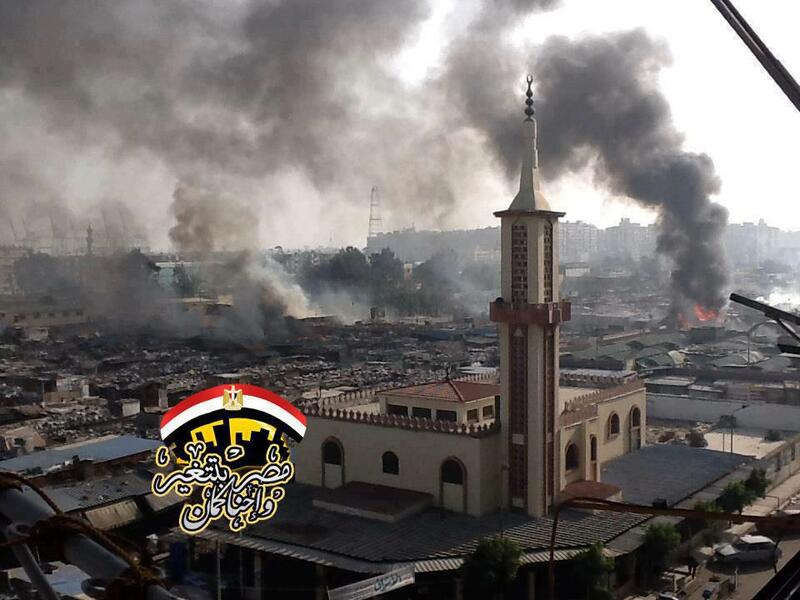 General Wasfy – head of the armed forces that is securing Port Said – has called for calm in Port Said, stating that those that have incited violence in the city, are not from Port Said. He added that the curfew is to help round up “outlaws” from outside the city. Despite these statements, protests are planned to coincide with the 9PM curfew. 5. The Shura Council has approved a law granting the Military the right to arrest. It has also approved the state of emergency declared in the Canal cities of Ismailia, Port Said, and Suez. 6. In Alexandria protesters have blocked off the Corniche, Sidi Gaber (outside the railway station) and other main roads. In Minya, protesters have cut off the railway line. Other cities also experiencing major disruptions and protests. Police officers in Alexandria and three other cities have threatened complete withdrawal if they are not provided with extra resources and if the unrest continues. 1. Curfew and State of Emergency declared in Port Said, Suez, and Ismalilia between the hours of 9pm-6am for 30 days. 2. [Insert bunch of words about how awesome he thinks he is and how he believes the recent violence is alien to the Egyptian people and Egypt’s revolution]. 3. Thanks the Armed Forces and Interior Ministry for protecting Egypt and Egyptians from thugs and ‘chaos’. Overall: Welcome to revolution 2.0. Morsi just punished every single citizen of Port Said, Suez, and Ismailia and threatened the whole of Egypt. Expect massive outrage. The National Salvation Front (Egypt’s opposition party consisting of top opposition leaders) has announced it will be meeting tomorrow to clarify it’s position – a day too late in my opinion. 1. 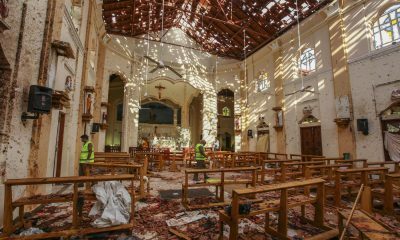 Over the past few days, the death toll has reached over 40 dead and more than 1,000 injured in the cities of Port Said, Suez, Cairo, and Ismailia, with Port Said experienced the most violence. 2. Violence in Port Said started on January 26th following the verdict on the Port Said Stadium Massacre which killed more than 70 last year. The verdict sentenced 21 to death – causing outrage among the citizens of Port Said who believe that the Ahly Ultras (‘soccer hooligans’ whose fans were killed in the Stadium Massacre and are located in Cairo) and other Cairenes were placated at the expense of Port Said. The violence has led to the death of 32 (including 2 police officers) and the burning of many buildings, including police stations and prisons. This is not Gaza, or Pakistan, or Iraq, but it might as well be. 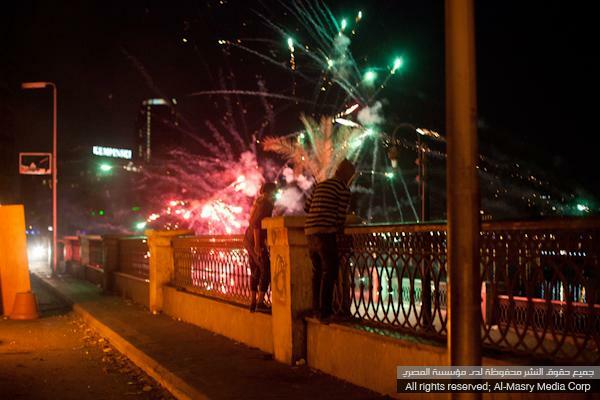 This is the city of Port Said in Cairo on January 26. 3. Today (January 27) Port Said has re-erupted into chaos after security forces randomly (with no provocation) fired tear gas on the funeral procession of 28 who were killed yesterday. The Armed Forces Club and several police stations have in turn been set on fire. More than 250 injured, and 7 have been killed after being shot by unknown assailants. 4. On January 25, Tahrir Square was full of protesters – CNN claims the number of protesters was greater than that of January 25 2011. Clashes between protesters and security forces have been on-going near Tahrir Square for the past three days amid very thick clouds of tear gas. 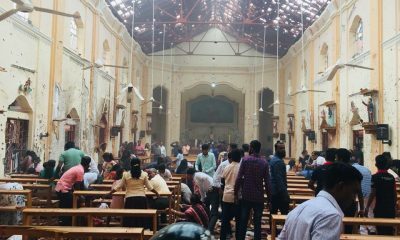 Several buildings were set on fire, including a school, a Military storage facility, part of a Ministry, and more. Tahrir Square on January 25, 2013 – early in the day. 5. Violence in Suez erupted and remained until the intervention of the Military. More than 9 were killed after security forces went on a rampage (to avenge the death of a police officer), burning cars and buildings while shooting randomly at the protesters. 6. Minister of Interior was forced to leave the funeral of a police officer, after police officers chanted “Leave, Leave!” Rumors of a potential mutiny if violence and unrest continues. Overall, the situation in Egypt is very volatile at the moment and the country is on the brink of collapse. A more detailed analysis will be posted here in the coming days. 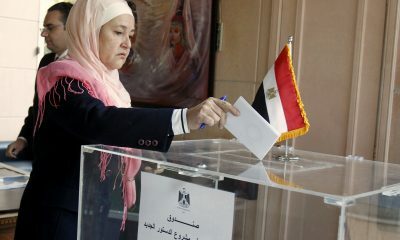 Egyptian women: "It's time for our voices to be heard"